It has been a very wet spring in the mid-south this year, with many stormy weekends. 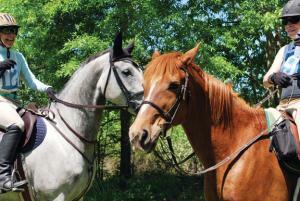 This weather pattern has been particularly hard on scheduled outdoor equestrian activities. 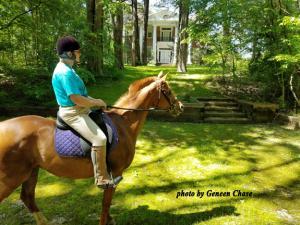 This spring’s Oak Grove Hunter Pace and timed trail ride had to be postponed several times. But perseverance paid off when on Sunday May 5, 2018, riders and their horses gathered at the fabulous Strawberry Plains Audubon Center near Holly Springs, Mississippi for a fun hunter pace and day of trail riding across the property. 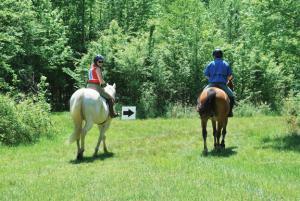 Teams of two rode a marked course through woods and open fields. There was an ideal set time to complete the course, and riders had to estimate how fast to go to meet the ideal time. Maps of the course were available, but the course was so well marked that the maps were hardly necessary. One fun part of the course was a refreshment stand set up mid-way, with drinks for both horses and riders: water, juice and Mimosas. 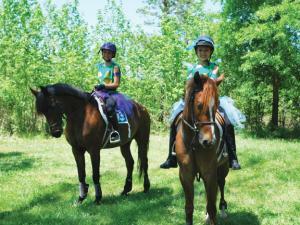 For a bit of whimsy, riding teams were encouraged to dress in costumes. Awards were given to teams with the average time, fastest time, and slowest time. Costume awards were given for the most creative and most enthusiastic. The management and staff of Strawberry Plains Audubon Center welcomed the riders, and accommodated everyone with plenty of parking, the use of equipment, and 15 miles of wonderfully maintained trails. Strawberry Plains Audubon Center is a jewel for wildlife enthusiasts of all types. Consisting of over 3,000 acres, it merges conservation with history. The Center was originally a working plantation, which was bequeathed to the Mississippi Audubon Society by two sisters, Ruth Finley and Margaret Finley Shackelford, with a vision of restoring the land to a natural habitat for birds and other wildlife, as well as to educate the public about conservation. Strawberry Plains staff have made concerted efforts to rid the place of invasive, non-native plant spaces that native birds will not eat and to maintain habitat biodiversity. Their conservation and education programs provide opportunities, such as camps and programs, throughout the year culminating in the Hummingbird Festival in September. There are restored historic buildings on the grounds, including the original antebellum Davis House and a plantation store. The remnants of sharecropper shacks dot the trails. These buildings hint at the story of hard working families, now long gone. Oak Grove Hunt Club will host another event at Strawberry Plains on July 21, 2018. Harmony for Hounds, an opera and musical theater benefit, will take place in the historic Davis House. Amanda McGee, Jt. Master of Oak Grove and singer with Opera Memphis, has invited opera singers and musicians to perform. The soiree is open to the public and children are encouraged to come and enjoy the music. For information about Harmony for Hounds, contact Amanda McGee (901) 606-2119 or sandamcgee@mindspring.com.